Workshops help sell more fabric and batting! 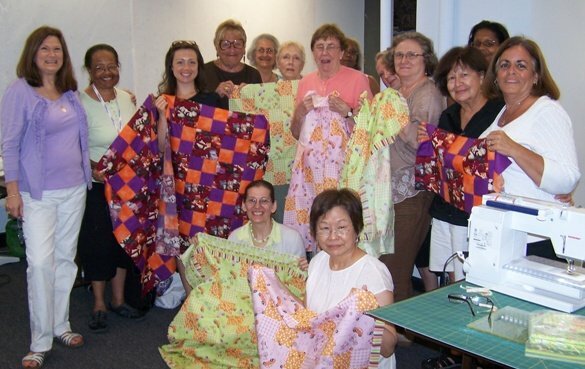 Currently, three quilt shops in New York, New Jersey and Pennsylvania host regular QFK workshops. In addition to benefiting children with serious illnesses, the workshops provide added interest from customers and higher foot traffic, which translate into more sales! Some shops act as quilt drop-off locations, regularly sending the quilts to headquarters; others place a "Quarters for Quilts" can near the register. You can print the label here. Last year a shop in California held a special sale to benefit QFK. A portion of the one-day sale's proceeds went to the local chapter. Other ideas include asking customers to donate an extra 1/2 yard or a fat quarter to be donated to a chapter near you, and just getting the word out about QFK in newsletters or mailings. Thanks to Quilters Corner in Chadds Ford, PA, Joy Full Quilter in Glenville, NY, and Pennington Quilt Works in Pennington, NJ, for their on-going support!